cafes all combine to encourage you to linger a little longer. The opportunity to visit the surrounding villages offers a rare opportunity to get to know the cultures of both the Maasai and the Chagga tribes, and should definitely not be missed! We have compiled for you a selection of the most interesting destinations for a day trip or a short tour. Our excursions are also a good addition to your safari or Kilimanjaro climb and can be combined as desired. We would be glad to provide you with an individual offer. 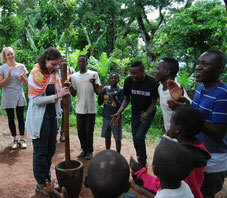 We are particularly proud of our excursion possibilities to the mountain villages of Materuni and Shimbwe. Both villages are located above Moshi on the slopes of Kilimanjaro and are surrounded by fantastic nature. Only about 30 minutes drive from Moshi and yet a completely different world. 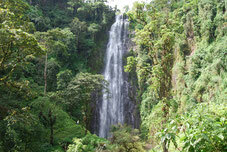 Materuni is known for the most beautiful and highest waterfall on Kilimanjaro. In the midst of lush vegetation and with a fantastic view of Kilimanjaro lies our small property, to which we would like to warmly invite you. A one-day waterfall & coffee tour, which can also be booked with an overnight stay or some relaxing days in our campsite - you can choose and decide how long you want to stay with us. 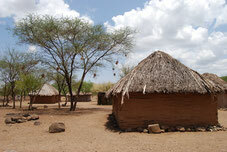 Shimbwe is still a very traditional and unspoilt village, which so far has only been visited by a few tourists. Here you will find hikes to almost untouched places with spectacular views, waterfalls and great mountain meadows surrounded by dense rainforest. The comfortable Shimbwe Meadows Guest House is the ideal place to relax and stay overnight, the view of Kilimanjaro and Mount Meru you get additionally for free. For more information about our accommodation facilities in Materuni and Shimbwe, see "Our Village Accommodation". Both places are well situated for your day trips into the surroundings of Moshi. The high altitude also allows you to get better acclimatizated before climbing the Kilimanjaro or Mount Meru. Make Moshi the starting point of your Tanzanian adventure and explore with us the cultural and scenic highlights of the surrounding area. 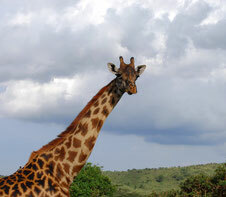 During this tour, you will have the opportunity to experience Tanzania's wildlife up close. The animal rescue center is located on the Makoa farm near the village of Machame and is a safe haven for healthy, orphaned and injured animals. Visit with our co-owner Gavrilo one of his favorite places near Moshi. 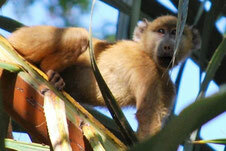 An oasis with many monkeys and various species of birds, which has not been yet discovered by any other tour operator. 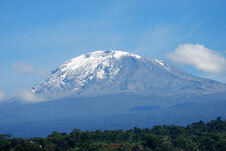 Do you want to experience Kilimanjaro at close range without climbing the summit? Our day trip takes you on the popular Marangu route to the first mountain hut, the Mandara Hut at 2700 meters. 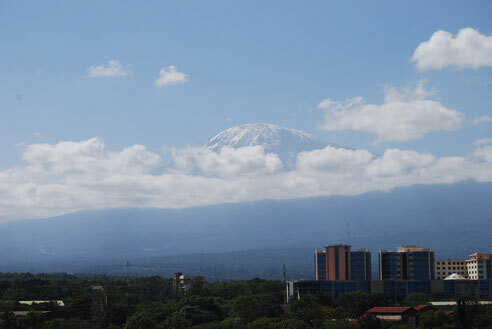 An ideal tour for the beginner to get to know the fascinating landscape of Kilimanjaro. Our exclusive hiking tour, which is not yet offered by any other tour operator. You will hike with us 2 days on the slopes of Kilimanjaro and visit with us the Mongioni waterfalls or a beautiful place on the border of Kilimanjaro National Park. Places that have been visited so far only by very few hikers and now want to be discovered. An insider tip for nature lovers and people who want to get to know the Kilimanjaro off the usual routes. You want to relax a day in paradise? Then come with us to the Kikuletwa Hot Springs. Surrounded by palm and fig trees, you can dream, chat with the locals and take a refreshing bath. 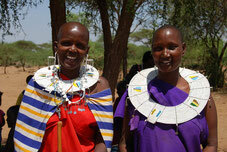 Spend a day with us in a traditional Maasai village, and get to know the culture of this unique people. Afterwards we drive to the hot springs of Kikuletwa, where we enjoy a relaxing bath. A day and a night at the Maasai - an intense experience in an authentic Maasai village that you will remember for a long time. 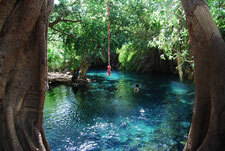 We spent the next day relaxing at the hot springs of Kikuletwa, one of the most beautiful swimming spots in Tanzania. A great day tour, full of sights. We first visit the famous mountain village of Marangu, the starting point of many Kilimanjaro ascents. 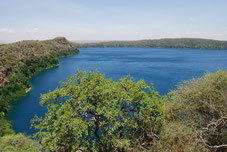 Then we drive to Lake Chala, after a hike through the scrubland you can relax and swim at the lake. This is always our most popular and most booked day trip –and for very good reasons! 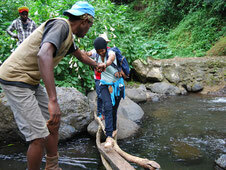 Visit our traditional Chagga village on the slopes of Kilimanjaro, where a varied and exciting day awaits you. Explore the most beautiful waterfall at Kilimanjaro and let the villagers introduce you to the secrets of traditional coffee making. From the slopes of Kilimanjaro to the hot springs. A great combination of nature, Chagga culture and relaxation. A long day with many impressions is guaranteed on this tour. The ideal extension after a day trip to our Chagga village Materuni. Be our guest and enjoy a night in this intimate setting.